Google has announced that it is offering all new feature that will allow to get rid of those unnecessary files that pile up on your phone over time and make device fresh all the time.Called "Screen Cleaner", that claims to wipe out all the dirt and germs from your smartphone's display, hence revolutionizing phone hygiene. Google claims that this new feature will eliminate dirt, smudges and other unwanted things which are present on your smartphone display. The new Screen cleaner feature is now available on Files app and whenever you want to get rid of the dirt, smudges on the smartphone display, just tap the 'Activate' button on the former. You can see the Screen cleaner in full action this video below. Company says that the Screen Cleaner will help in eliminating dust, dirt, smudges, and other unwanted things that are present on user’s smartphone screens.How the company is doing that, well Google does it so through API , which can identify residue and imperfections on the surface of the screen. 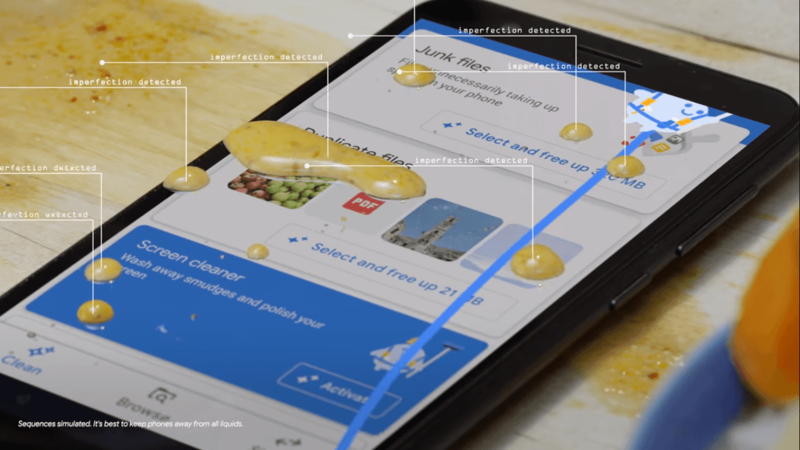 After detected, the residues are shaken off by smartly targeted micro movements.Google says it's using "geometric dirt models" and "haptic micromovement generator" to remove dirt from the screen. It uses the phone’s vibrating motor and haptic controls to generate micro vibrations to to form a long-lasting dirt shield around the phone that further keeps your handset sparkling clean. The app was first launched in 2017 under the name Files Go as a free app that can be downloaded through Google Play Store.The app is compatible with devices running on Android 5.0 and above. The app can be used to organize the files and folders in a smartphone. Once users install on the handset, users can see that the Screen Caller is ready to function.